Two years ago Chile experienced phenomena that some called “toxic tides”. First came 23 million salmon dying off its coast. 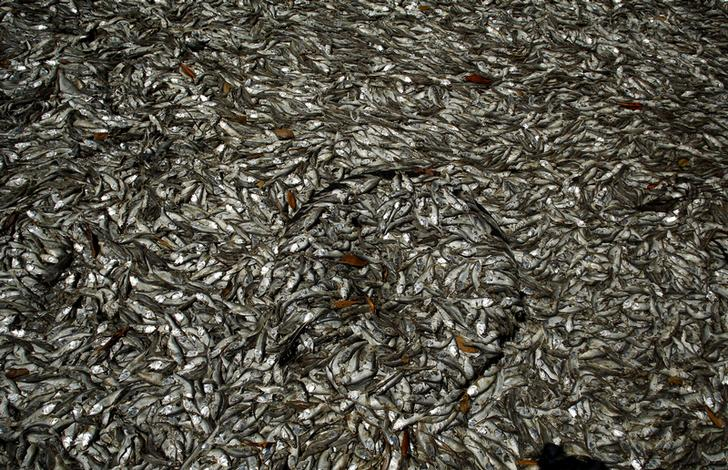 Then thousands of dead sardines washed up at the coastal town of Toltén. After that came beached clams, dead jellyfish, birds and even mammals. The Chilean government blamed the deaths on algal blooms, which are rapid increases in algae levels. Also known as red tides for the colour of the algae in the water, these blooms drain oxygen from the water as they die and decompose, suffocating the marine life around them. Algal blooms in coastal waters are caused by a combination of warmer-than-usual sea temperatures and high levels of nitrogens and other pollutants running off land into the ocean. 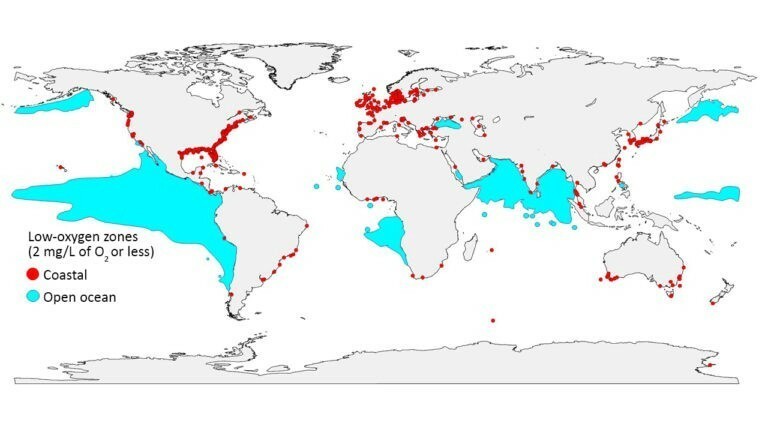 This combination of rising sea temperatures and nutrient pollution from sources such as agriculture and sewage is responsible for a dramatic rise in so-called “dead zones” in the world’s oceans. Dead zones are areas of the ocean where oxygen has fallen to such low levels that most marine life cannot survive. A new study by a group at the UN’s Intergovernmental Oceanographic Commission reveals that far from being an isolated case, Chile’s toxic tides of 2016 may well be just the tip of the iceberg. According to the study, led by researchers at the Smithsonian Environmental Research Center in the US, dead zones in coastal areas across the globe have increased tenfold since 1950. Warming sea temperatures have also quadrupled the spread of dead zones in the open ocean, which is less exposed to the nutrient pollution that can wreak such havoc with coastal waters. The scientists behind the study are clear that man-made climate change is behind the increases in sea temperatures that are cutting oxygen levels. Warming waters cut oxygen levels in several ways. Firstly, they increase the stratification of the ocean and weaken overturning circulation in the water. This means less oxygen finds its way from the atmosphere and surface waters to further down in the ocean. Secondly, rising global temperatures decrease oxygen solubility in water, meaning marine life has to consume more oxygen to breathe. Finally, in coastal waters, warmer seas combined with excess nutrient pollution from land create the harmful algal blooms, which drain oxygen as they die and decompose. Not only are humans to blame for the climate change and water pollution behind the dead zones, they also suffer from the damage that is being done to our oceans, say the researchers. Approximately half the oxygen on earth comes from the ocean. As those levels fall, the pace of climate change can accelerate, with low oxygen levels triggering the release of chemicals like nitrous oxide. This greenhouse gas is 300 times more powerful than carbon dioxide at trapping heat in the atmosphere. Humans also suffer at an economic level. Chile’s 2016 toxic tides wiped out 20% of its salmon stock, costing the country $1 billion in lost sales. And for small-scale artisanal fishermen in the developing world, a collapse in fish stocks means a loss in livelihood. Toxic tides can have a devastating effect on marine life. There may be some fishing operations that benefit in the short term: a rise in dead zones means fish have a smaller area in which to swim, which could lead to concentrations of fish in certain areas. However, the report’s authors warn this could soon lead to overfishing. Tourism could also be impacted, with the report’s authors noting that low oxygen levels – which the study defines as 2 milligrams of oxygen per litre of water or less – can kill coral reefs. Despite the rapid spread of dead zones along the world’s coasts and out in the open ocean, the UN working group behind the study say all is not lost. They point to examples such as Chesapeake Bay on the US Atlantic coast and the Thames river in London as examples of dead zones brought back to life after strict air and water pollution controls were introduced. “This is a problem we can solve,” says lead author of the study Denise Breitburg, a marine ecologist with the Smithsonian Environmental Research Center.